Today we attended the 10th Annual Desert Garden Community Day, sponsored by our local Desert Horticultural Society. 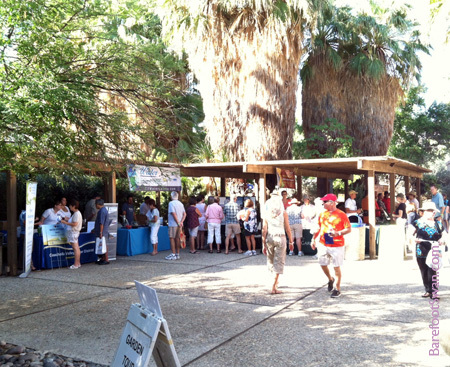 The event was held at the Living Desert Zoo and Botanical Gardens in Palm Desert. 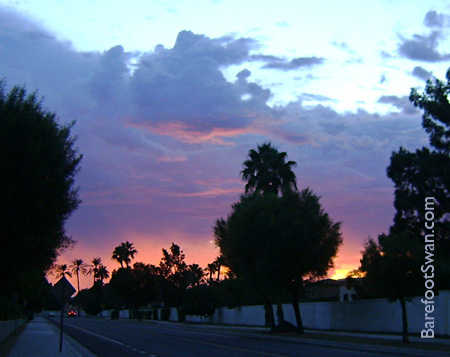 The Desert Horticultural Society of the Coachella valley was founded in 2005 to "promote the use of desert appropriate plants that support local wildlife and conserve water". With the increasing fragmentation of local desert habitat and our ongoing drought, these goals are especially important and timely. The event brought together various non-profit groups, government agencies, educational facilities, local conservation projects and businesses that promote native plants, water conservation and drought tolerant landscape concepts. 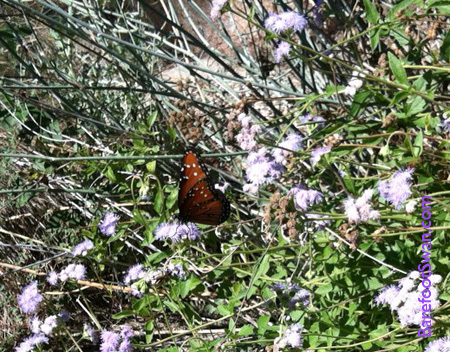 There were also a number of free classes offered with topics covering lawn removal or reduction, proper pruning techniques, growing vegetables in the desert, plant propagation, the Monarch Project at Sunnylands, desert landscape design and water conservation among others. After talking with the many exhibitors and taking a couple of the classes, we headed over to the Butterfly Garden to get some new plant and landscape design ideas for our yard. 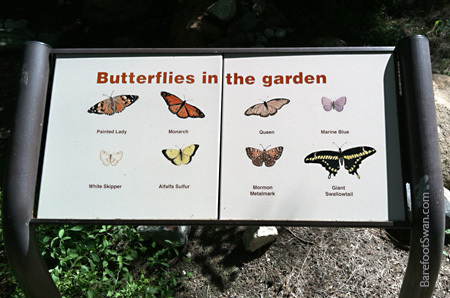 The Butterfly Garden is beautifully landscaped with a variety of plants that provide food for caterpillars, nectar for the adult butterflies, and host plants for butterflies to lay their eggs on. There are also basking rocks for sunning, and mud areas for puddling. 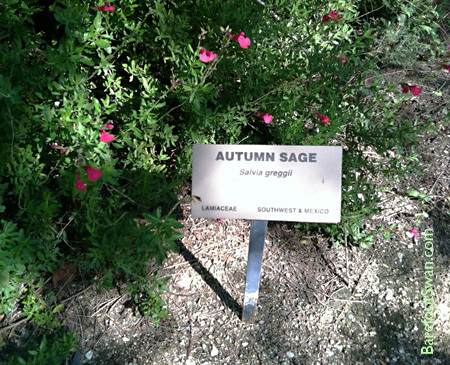 The plants are labelled with common and scientific names, and many are for sale in the Living Desert's nursery. The nursery also sells many other desert native and drought-tolerant plants as well as yard art, ceramic pots, and a good selection of books about desert gardening. 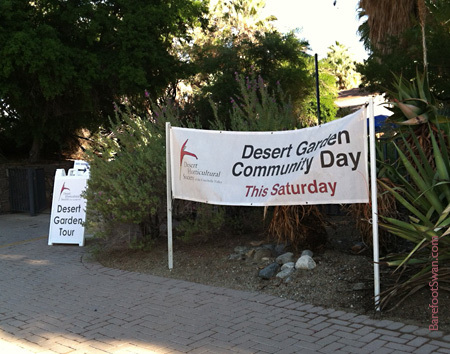 Desert Garden Community Day was a great opportunity for the public to learn about native plants and the work that these participating groups are doing to promote them. Big thanks to the staff and volunteers who made this informative and interesting event possible. >> Use the magic of Google to find similar types of organizations and events in your area! 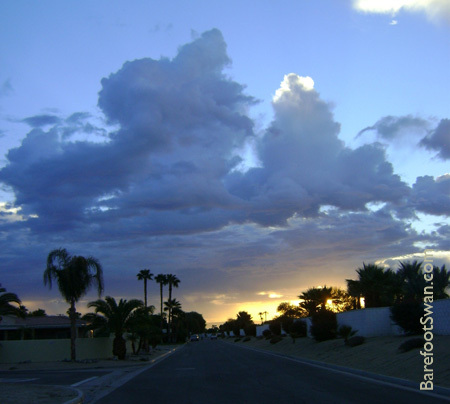 When you live in the desert a little rain can be a big deal. 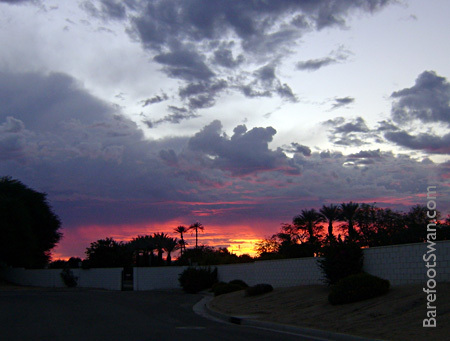 In addition to the much-needed precipitation, another benefit is the amazing sunrises and sunsets that often accompany the rain clouds. Colors courtesy of the Supreme Creator, no Photoshop needed. 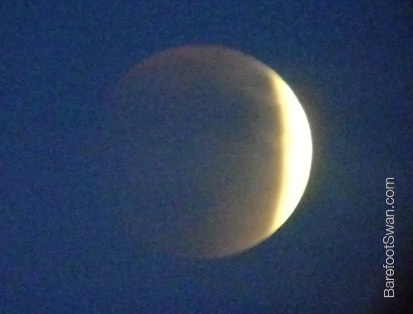 This total lunar eclipse on Sunday 27 Sept was special for a couple of reasons. First, it occurred during a "super moon", which is when the moon appears slightly larger in the sky due to its relative closeness to earth in its elliptical orbit. Second, it is the final lunar eclipse of a tetrad - a series of 4 total lunar eclipses occurring 6 lunar-months apart. 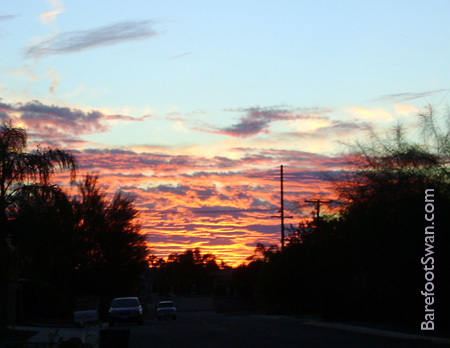 Third, it was easy to see because here on the west coast it began just after sunset. So no need to set the alarm to wake up at "what-the-heck-were-we-thinking" o'clock and wander outside to view while half asleep. And finally, we had a convenient viewing spot with an unobstructed east horizon, less than a mile from our house. 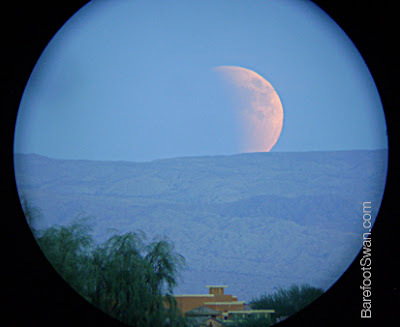 All pics were taken while holding our digital camera to the eyepiece of our 25x field scope. 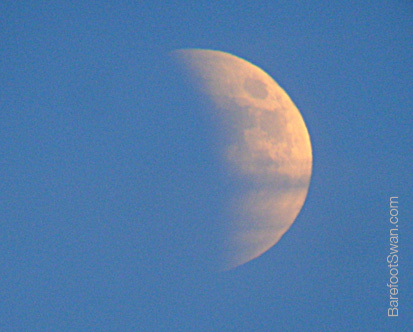 The moon rose already in partial eclipse. We soon noticed that there were some thin low clouds on the horizon. They created a band-like appearance across the face of the moon. As the eclipse progressed we could notice the moon began to take on a reddish color. This is caused by the sun's light passing through the earth's atmosphere on its way to the moon. 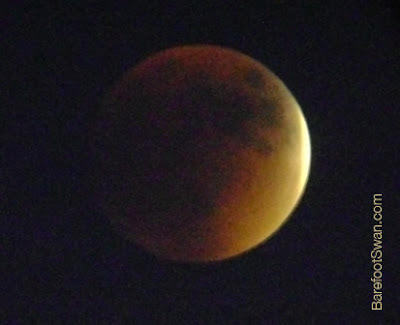 The redness became more pronounced as the moon passed deeper through the earth's shadow.